In the American mind, state subsidization of writers and artists was long associated with monarchies and, in later years, socialist states. The support these regimes gave to intellectuals was understood to come with a cost, yet, beginning with the New Deal's Federal Writers', Art, and Theater Projects, a new policy consensus asserted that by offering financial support to the arts, the federal government was affirming their importance to the nation.Subsidizing Culture examines the development of and controversies surrounding federal programs that directly benefit writers, artists, and intellectuals. 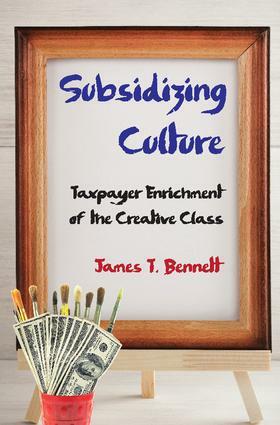 James T. Bennett examines four cases of such support: the New Deal's Federal Writers', Art, and Theater Projects; the vigorous promotion, in the post-World War II and early Cold War eras, of abstract expressionism and other forms of modern art by the US government; the National Endowment for the Arts (NEA), which has fortified its position as the preeminent arts bureaucracy; and the National Endowment for the Humanities, the NEA's less embattled twin, which funnels monies to scholars.Bennett concentrates on the creation of and the debate over these government programs, and he gives special attention to the critics, who are usually ignored. He reminds us that the chorus of anti-subsidy voices over the years has included such disparate figures as writers William Faulkner and John Updike; artists John Sloan and Wheeler Williams; and social critics Jacques Barzun and H.L. Mencken.